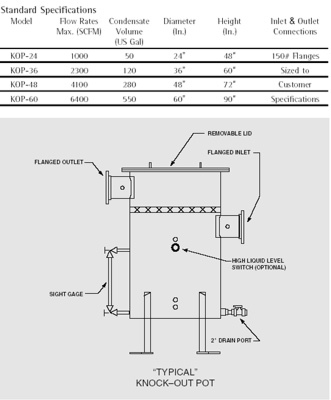 LFG Specialties manufacturers a full range of condensate knock-out pots specifically designed for landfill gas application. Full range of flanged connections —2" through 24"
LFG Specialties will also custom engineer and manufacture knock-out pots and liquid separators to meet specific customer conditions and specifications. Fabrication The KOP is fabricated/welded in accordance with ASME Code Section 8 for Unfixed Pressure Vessels. Painting Interior: All interior surfaces including inlet and outlet connections are sandblasted to white metal. A coat of Amerlock 400 high-solids epoxy coating is applied and allowed to dry a minimum of 2 hours. The dry film thickness to be a minimum of 5.0 mils. NOTE: High-solids epoxy coating is specified for coating tanks and equipment subject to long-term service in highly corrosive environments. Any damage to the coating, due to causes beyond normal operation/exposure to corrosive condensate, will void the warranty on the epoxy coating. Our carbon steel KOP with high-solids epoxy coating is considered superior to an HDPE unit in regards to withstanding temperature and pressure extremes. The life expectancy of both types of units can be considered as equivalent. Exterior: All exterior surfaces are sandblasted to commercial finish. A coat of industrial grade zinc oxide primer is applied and allowed to dry a minimum of 2 hours. A color coat of industrial grade enamel is applied as final finish. The KOP is assembled and all openings sealed/plugged. The KOP is filled to a minimum pressure of 5.0 PSIG with compressed air. The tank must maintain the pressure for 30 minutes to obtain test certification.